Now, the last thing you want to do is to wake the dragon while you are trying to walk out with the loot, but on the chance that the mighty beast begins to awake, the player has the means to sing the dragon to sleep with SSSHHH action card. On the other hand, you’ve grabbed the loot and like they say, you only have to be faster than the other person, the player has the means to awaken the dragon from its restful slumber. There are also cards that depict a shield and a sword, probably left over from the poor adventurers who got chomped by the big nasty dragon. There are meeples in the box for the individual players, a dice that enables a user to move from 1-5 spaces. You may be wondering what happened to the number 6. Well, In this game, the number 6 has been replaced with a symbol which acts as a wildcard, the player can remain in their spot or they can announce how many spaces they wish to move. There isn’t much in the box and to be honest, there doesn’t need to be to enjoy this game. The footprint of the game is not that big and it can be easily played on a coffee table. If you are lucky enough to have a fancy gaming table, you’ll have no problem with the space that this game takes up. The set-up of this game is straight forward, as a player, you first place the dragon cards on the table with the blue side facing upwards. This is to signify the slumbering beast who’s probably dreaming of flying through the skies looking for something to eat, maidens to capture and gold to take home. Surrounding the three dragon cards are 12 treasure cards that are placed face down. Each player then takes their meeple and chooses a card to start on, before they place their meeple on the card, they peek at it. Once everyone has done this, the looting can begin. At the start of the game, five cards are dealt to each player. The objective of the game is to collect enough treasure and amass more points than your opponents, because in true adventure style, more treasure means more glory and wealth. However, if you are too greedy and try to get too rich, then the other players can wake the dragon ending the game. 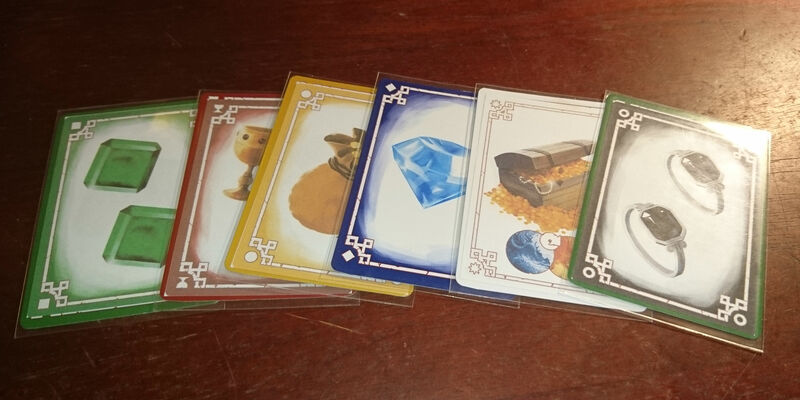 The players can move around the board, looking at the cards and trying to remember what treasure would be good to pick up to make a complete set in their hand. A set in this game is when they have three treasures of the same type in their hand. Once they have this, then they can put down that set and score points. Sounds simple huh, but there are certain treasures that can stir the beast. This card is the wildcard, depicted by a treasure chest. As you can imagine, it contains a lot of gold and jewels, enough to see your family survive the winter for many nights. However, I dare you to drag a heavy chest across a mountain of treasure. Not so ninja like now are you? It makes noise, a racket. Enough to wake the dead, or at least the dragon whose home you’ve decided to ransack. A blue dragon card now becomes red as you flip it over. So the dragon is waking up, you’ve got to think fast. You didn’t come all this way to be a morning snack and you’ve got things to do, treasure to steal, so what do you do? You sing it to sleep and tell it, that it’ll be OK. This is where the dragon action card comes in, by playing the SHHH! card, you can turn over the red card back to show the blue face and all is well. You look over to your comrade who seems to be grabbing more loot than you, so being the not so trusting thief, you pick up the nearby sword and charge at them (quietly of course) and attempt to steal some of their treasure. They knew that you were up to no good and deflect your puny attempts with a shield and steal your sword along with your dignity. So in a nutshell, you move around the dragon picking up treasure cards (or from the draw pile) and score points by collecting a set of treasures (3 of a kind or more), you can extend the set by two treasures at a time (initial set is 3, then you can add 2 more, then two more,etc). Once the deck runs out, you have no cards in your hand or the dragon wakes up, the game is over. The set of treasures are scored, the winner of the round gets a 2 point token, the runner up gets a 1 point token (the first to 5 wins). This game is simple but has a surprising amount of depth and strategy to it. As a player, you are constantly looking at the board and determining where the treasure is, you then have to remember where it is while picking up cards and determining what treasure is going to be good for your hand. The question that you have to ask yourself is do you go for the quick win with what you have in your hand and limited exploration (if you are lucky enough to have a good starting hand). You can then wake the dragon before your opponents have a chance to amass a good set. This would be akin to going into the cave, grabbing a few trinkets and getting the hell out of there. The other risky move is to amass your collection but you tease the dragon, you wake it up a little and then you sooth it to sleep. Why would you do this? During the game, if you use exactly three dragon action cards (Bones/Shh), you can score five points. Sometimes, a couple of points is all it takes to win the round. 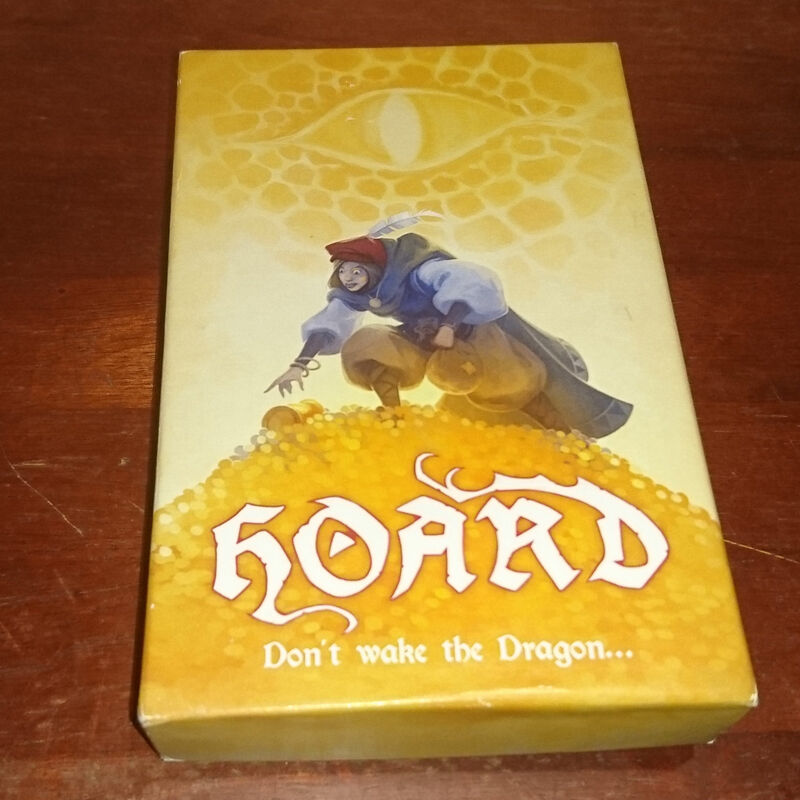 My final thoughts on Hoard is that this is a nice quick game that you can pull out of your collection and play immediately. It’s not a heavy game by any means but you do have to engage with your opponents, you have to pay attention to the board as it shifts and changes with each players actions. The card that you wanted might not be there by the time it gets to your turn. I like to think of this like extreme geocaching. You find the treasure, go home to get some supplies and by the time you get back, the treasure has changed. The memory aspect is a good touch and I feel that children would enjoy this game based on the artwork and cards. I find that as they play the game and get used to the gameplay, it will improve their memorisation skills and develop their skills in balancing risk vs. reward. I know that when I played it, I had to try and avoid thinking about other stuff or letting my mind wander as I would seen forget what treasures I needed and where they were located on the table. We enjoyed the gameplay and we found ourselves going back to it time and time again due to the quick nature of the game. Posted in Card Game, Kickstarter, Review and tagged Cheeky Parrot, Review. Bookmark the permalink. Excellent review, especially loved the pithy bits! Just wanted to point out that establishing a set requires three OR MORE matching treasures, so even if you get lucky and receive three in the deal, it might make sense to wait a little longer to see if you can grab any more of that type before using a turn this way. There’s always an opportunity cost. Thanks, I’ll make that small change – Thanks for the comment.